I must first state that I'm not a parent, but I have taught high school and middle school. My current work focuses on providing tweens and teens (and the educators that serve them) with healthy hands-on learning experiences and promote whole-person wellness. That said, I would like to share a quick personal story. A few years ago, my husband (and business partner) and I were hosting my niece's 13 year old birthday party at our house. Being the big kid that he is, my husband broke out the tools that we use in our workshops - skill toys such as spinning plates, flower sticks, and other juggling like objects that are "powered" by physical skill and practice. The toys were a huge hit and it wasn't until about 45 minutes later that the first phone came out. And it was to take a picture of one of the girls with a couple of plates spinning . It was that night that we came up with the line - "Hands-on and thumbs free!" Provide Choice - Tweens and teens spend all day in school being told what to learn. If they are involved in activities like soccer or dance, they are often being directed through drills or routines. Where can they exercise autonomy over their own lives? Provide them with choices about what activities they can try, but then also think about the activities that can be pursued in different ways. 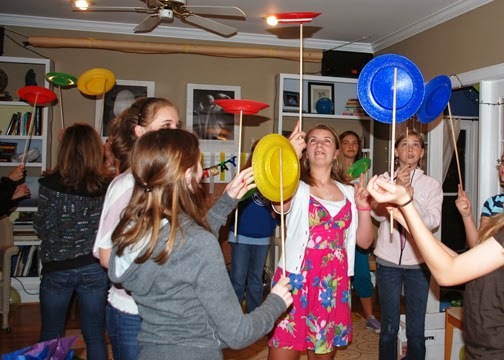 For example, jugglers can be competitive and try to break records or they can be creative and put together performances. They can pick what tricks to work on next. Autonomy is a necessary component of motivation. Allow for Mastery - Experiencing achievement will further motivate the individual as well as build confidence and self-efficacy. Maybe they can bake a cake for the next family event or train your dog to learn new tricks. Think about activities that will allow them to "level up" like video games tap into so well. Present Risk - I won't go into too much detail here, but there's a bunch of new research on the teen brain and how it is wired to be bored in order to prime them to practice risk taking and eventually "fly the coop." Find activities that they can try that allows them to exercise risk taking in a fun way. Maybe it's learning a new skill like surfing, skating, or juggling! Strengthen Social Connection - Teen brains are also primed for building connections outside the family. Activities that they can do or share with friends will have more likelihood of success. Imagine being able to share on social media that they learned a new skill instead of just posting another duck face photo! Most importantly, be willing to engage with them in unplugging. We may not realize it, but we are their role models. I remember as a kid watching my mom sit down with a book just about every night. Now as an adult, I'm a reader, too. We all love (and quite frankly are dependent on) technology, but if we as adults can't unplug for a little while, tweens and teens will see right through the hypocrisy or in their language see it as "unfair." I believe strongly in providing active, unplugged learning experiences for kids and adults and it infiltrates the book that I wrote, the workshops we conduct, and the app that we are building. Over the course of the story in Grounded for Good, Derek has the opportunity to discover an activity that allowed for risk-taking, mastery, and building social connection that gets him in a lot less trouble! Our current project to create an app that will motivate tweens, teens, and adults to unplug. Counter-intuitive maybe, but necessary for creating balance. Skoyz will provide curated instructional videos on a variety of skills like juggling, allow users to log and reflect on practice, and share successes. A first iteration is out now with a limited number of videos to watch, but we are planning to build the rest of the functionality by the fall. More information about the app at Indiegogo.com/projects/skoyz.